Porsche unveiled the 911 in 2013 and since then has commendably walked over the boulevard of success. 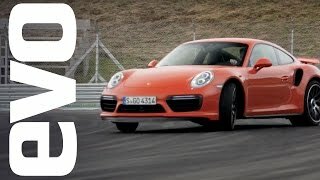 This time at the 2015 Frankfurt Motor Show, they nailed it with the Porsche 911 Turbo S 2016. Featuring a powerful engine housed beneath the aggressively designed body and delivers remarkably quicker sprints. 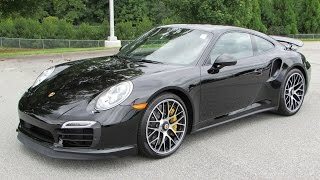 Let us have a closer look at the specifications and features of the Porsche 911 Turbo S 2016 through its review to know better. The interior of Porsche 911 Turbo S 2016 doesn’t receives much of change however there are some that make this model distinct in comparison to its predecessor. The first change that you’ll notice will be the analogue clock that is mounted over the dashboard followed by the changes that come through the Sport Chrono Package. The latter includes a mode switch button and response button. The steering wheel gets redesigned; however it still has resemblances with the 918 Spyder. The mode button mounted over the dash allows you access over the four driving modes; Normal, Sport, Sport Plus and Individual. Each of these modes decides the way your powerful Porsche will deliver you the drive experience. Talking further about the features, it comes integrated with Communication Management with Online Navigation. These features come with the infotainment system. The center console includes a glass, multi-color touchscreen and Connect Plus module. In all the interior of Porsche 911 Turbo S 2016 has everything from luxury to sports and till the technology making the drive convenient. Just like interior, exterior of Porsche 911 Turbo S 2016 doesn’t receives enough upgrades but still it has everything to steal the gleam. Starting with the front fascia model is adorned with sloping hood and the large air vent to send some cool air to engine sitting beside the massive intakes for the wheels. The LED daytime running lights get narrow look making the overall appearance wider. Moving towards the rear end you’ll notice the 9*20 inch wheels at the front while the rear portion has 11.5*20 inch wheels giving it sportier look and perfect grip. The rear end gets an aura-like illumination; the one we recently noticed in Carrera model. The exhaust too gets blend of redesign with the dual tailpipes giving a remarkable blend. However a personally believe that the rear lid grille is the most auspicious part contributing in the overall look of the model. 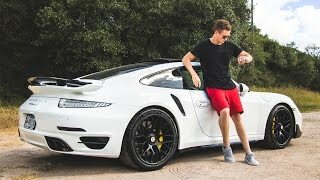 Thus rounding up the exterior details of Porsche 911 Turbo S 2016 I would just say it is luxurious and sportive both with lots and lots of aggression. Beneath the hood of Porsche 911 Turbo S 2016 is a 3.8 liter Boxer six engine mounted at the rear of the model. The engine cranks total output of 580 hp. 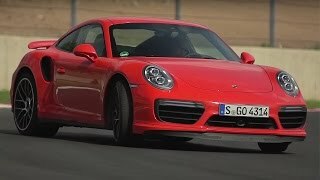 The top speed of Porsche 911 Turbo S 2016 touches the mark of 205 mph while the 0-62 mph sprint can be knocked in just 2.9 seconds.